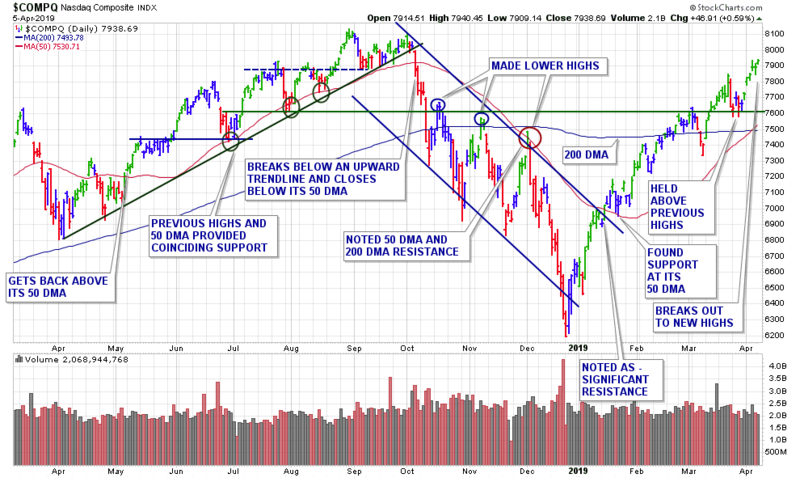 The major averages started last week off strong with a gap open Monday morning, and then went on to close Friday at their highest levels of the new year. The indices are now within -2.5% of record highs. After adding over +400 points during the previous week, the Dow Jones Industrials added another +496 points this past week. The index netted a +1.9% weekly gain to close at 26,425 – well above the 26,000 hurdle . The blue-chips have also cleared the previous highs of early November and late February. Those highs had been noted as an area of resistance, and now could offer support in the event of a pullback. Chart services courtesy of stockcharts.com. Annotations by James Taulman. The Nasdaq Composite gained +2.7% or +209 points on the week, adding to last week’s +1.1% advance. The index closed the first week of April just shy of the round-8000, at 7,938. The S&P 500 index added a solid +2.0% advance this past week closing at 2892.74, gaining +58 points. The index closed Friday – up 7 sessions in a row – marking its longest winning streak in 18 months. 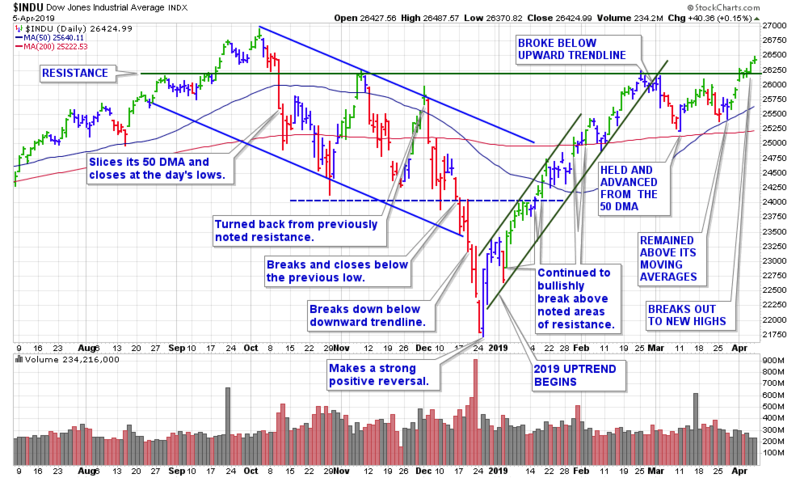 With back-to-back bullish weeks, the market is now again in a confirmed uptrend. 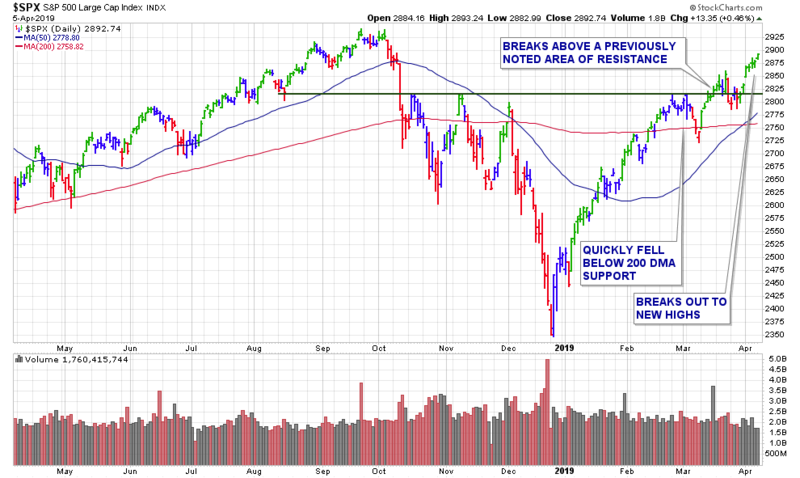 Also of note, there has been a reduction in the distribution day count which is currently – 4 on Nasdaq and 5 on S&P 500. I ran my routine stock screens over the weekend and added 3 new stocks to our watch lists. There are a total of 17 stocks on our watch lists. – see here. Current Personal Portfolio Members can access all watch lists with updated trading criteria including – TRIGGER PRICE, TRIGGER VOLUME, and MAX BUY PRICE for every stock here.